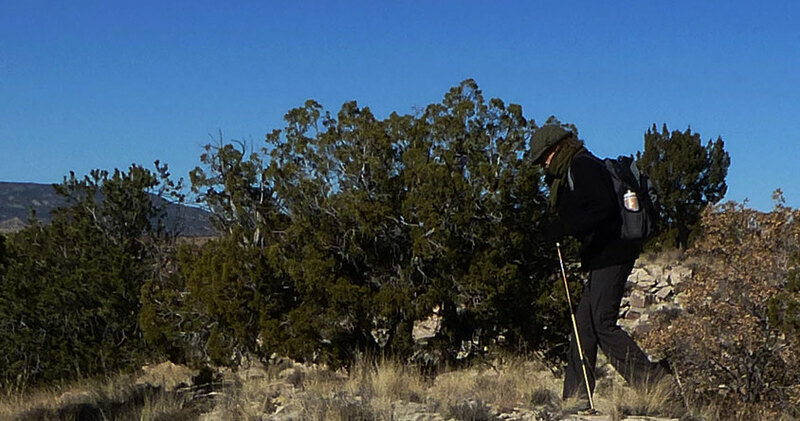 A loop hike in the Ojito Wilderness west of Querencia Arroyo. One stop is a location where Seismosaurus remains were recovered—not that you can tell today. The access road and the hike cross shale and shouldn’t be attempted after heavy rain or snow. Hiking poles will help with the scrambles on mesa slopes, but otherwise this is easy country and you can explore without an agenda. On US 550 northwest from Bernalillo, turn left on Cabezón Road before arriving at San Ysidro. Shortly after passing the anticline parking area, at 35 deg. 29.768 min. N, 106 deg. 50.687 min. W, continue straight (instead of turning right on Gasco Road). At 35 deg. 28.970 min. N, 106 deg. 50.881 min. W, turn right to stay on Cabezon Road. About 2 miles (3 km) farther on, the road curves right (northwest) and drops into Querencia Arroyo. The road then turns west. At 35 deg. 29.740 min. N, 106 deg. 54.398 min. , turn left and and park. To begin the hike, cross the road, go through the gate, and follow the two-track to the northeast. At 35 deg. 30.071 min. N, 106 deg. 54.212 min. W ("BEGIN LOOP"), the two-track curves to the northwest. Follow the two-rack as it meanders in that general direction, to a petrified log at 35 deg. 30.353 min. N, 106 deg. 54.541 min. W. Continue west to the tip of the mesa. The dinosaur dig was in the sandy area at the mesa tip. Return to the log, then pick your way down the slope to the northwest. Once at the base of the mesa, curl around to your right, following the base of the mesa, until you’re headed SSE up an arroyo. At the rock formations at 35 deg. 30.319 min. N, 106 deg. 54.311 min. W, the arroyo bed turns south. Your goal is a pass at 35 deg. 30.233 min. N, 106 deg. 54.313 min. W. From there head south and east about 100 meters, then turn east in a bare valley. At the head (east end) of the bare valley the terrain drops off to Querencia Arroyo, but once at the valley head your goal is to curl south and west and climb the ridgeline formerly your right. One point on that ridge is 35 deg. 30.152 min. N, 106 deg. 54.083 min. W. The ridge takes you to the top of the mesa with the two-track to the dinosaur dig; if you head southwest to BEGIN LOOP, you'll link up with the two-track and can take that back to your car. I'll close with a few petroglyphs seen along the way. Perhaps you'll see them as well.